Shelton, Wash. – The Squaxin Island Tribe is getting set to open its new Salish Cliffs Golf Club, the much-anticipated 18-hole course and amenity of the Little Creek Casino Resort located about 75 miles from Seattle. Industry pundits who have previewed Salish Cliffs’ par-72, 7,300-yard championship layout say it could be one of the best new courses once it opens later this fall. 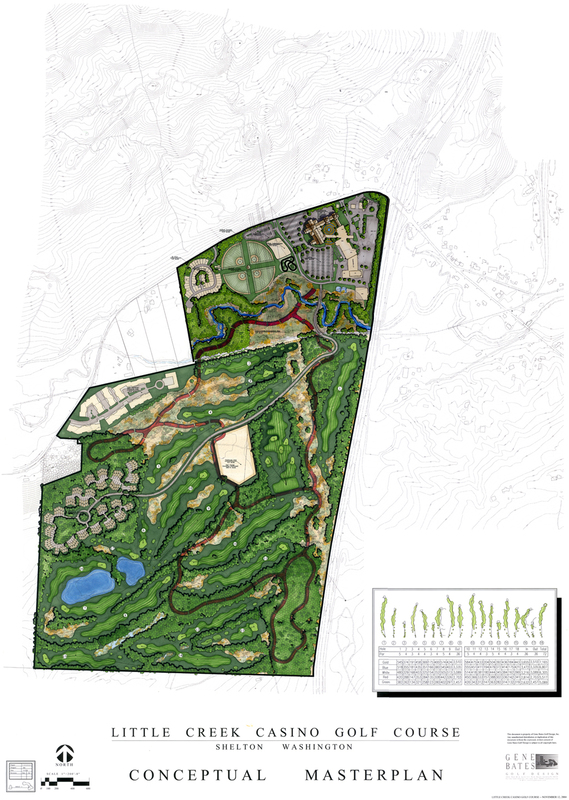 Boasting 360-degree views of the Kamilche Valley, golf course architect Gene Bates designed 16 of the 18 holes to be encircled by lush forestry with the overall layout featuring lots of natural vegetation. Salish Cliffs features rock facings with elevation changes up to 600 feet and smooth transitions between holes. Characterizing the course are uphill and downhill challenges, notable bunker placements and shapes, and strategic directional changes using hillsides as running elements. Bates designed the course to challenge better players and give high handicappers an opportunity to not get beat up. Among the signature holes is No. 12, the 437-yard, par-4 with wonderful panoramas and a 100- foot elevation drop from fairway to green. Confronting golfers is a large, cavernous bunker along the left side of the fairway and around the face of the green. Another memorable hole is the 440-yard, par-4 No. 16, highlighted by a natural, banana-like dogleg right that plays off the hillside slope with wetlands meandering the fairway. An elongated green awaits golfers whose club selection is put to test. Salish Cliffs caps off the experience with a lake and wetland preserve separating the par-5, 540-yard No. 18 with the par-4, 415-yard No. 9. The holes share an expansive 15,000 square-foot double green. Atypical to the Northwest, preferred bentgrass stretches tee to green bordered by pure ryegrass in the rough for a distinctive, contrasting look. For its ecological stewardship, Salish Cliffs has already achieved a rarity in golf, earning “Salmon Safe Certification” for its high standards protecting the wetlands and natural environment. Salish Cliffs is certain to resonate with golfers who rave about other Gene Bates layouts. These include Circling Raven Golf Club in Worley, Idaho, and Bayonet Black Horse in Monterey, Calif., both of which were ranked among the best in Golf Digest and Golfweek publications. Bates often collaborates on designs with PGA and Champions Tour star Fred Couples. Owned and operated by the Squaxin Island Tribe, Little Creek Casino Resort features nearly 190 luxurious, well-appointed rooms. The Indian-style gaming casino showcases more than 900 slots and table games, including poker, blackjack, craps, roulette and Texas Hold-Em. Quality, live entertainment is available at the new, onsite Skookum Creek Event Center that hosts business and other events for up to 2,000 guests.